Haute Residence welcomes accomplished realtor Tina Perkins to its prestigious network of top real estate professionals. As a Haute Residence partner, Perkins exclusively represents the high-end real estate market in West Hollywood, California. Celebrity & Luxury Realtor, Tina is an accomplished business executive who has worked alongside the biggest names in the sports and entertainment industry over the last decade. She has worked in the fashion industry as a celebrity fashion stylist for the NFL, Ford Models NYC, Maserati and Athletes Against Drugs, to name a few. Her tenacity and uncanny ability for meeting the needs of others led her to real estate. 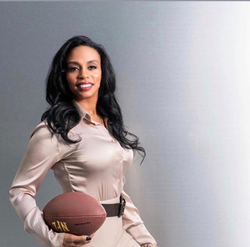 Due to her sports background, she created “The Real Estate Draft”. Just as players are drafted into professional sporting leagues, Tina drafts her clients and pairs them with the best property possible. Tina utilizes her knowledge, confidence, and determination to broker each deal. Although it is her attention to detail and discretion in dealing with, not only high-profile and military clientele, but all clientele, it is her personality that makes her one of the most relatable realtors. Born and raised in the great “Don’t Mess with Texas” state, Tina has the same attitude when it comes to her clients. Don’t mess with her clients! She fights for not only their needs, but their wants. Her background in the fashion industry makes her the perfect realtor for the hip and trendy West Hollywood. Tina attended Texas Southern University in Houston, Texas and will attend Harvard Business School in the fall. She now resides and works in Beverly Hills where she is a realtor at Douglas Elliman on one of the top-producing teams of Jeeb O’Reilly and The Zanuck Group. She is also a board member of the non-profit organization, Face Forward, advocating for domestic violence and human trafficking victims. Tina believes faith without works is dead. So, she makes sure to work above and beyond for her clients’ needs to achieve their dream homes.